I have been in the kitchen literally all weekend. My youngest is in a massive growth spurt and as soon as he has finished one meal he is ready for the next. He also doesn't just eat little meals or sandwiches, he wants full on pot roast or burgers. I think that he gets this from my husband. On Friday I made a pasta dish with chicken sausage. Today I found out that after dinner my husband went in and made himself turkey sausage as a snack since the meal didn't have enough meat. Some days I think that it might be easier to have girls instead of a house full of three males. I don't even want to think about how bad it will be when they are teenagers. Since I am being eaten out of house and home I have been baking and cooking a ton. Last week I tried a new recipe for Coconut-Carrot Morning Glory Muffins from the February 2013 issue of Eating Well magazine. This recipe has 14 ingredients. It takes a total of 1 hour, 20 minutes of which is active and makes 12 muffins. Since I eat gluten free I did make a number of modifications. First instead of using wheat flour I used all-purpose gluten free flour. The flour that I prefer has coconut flour as a base and works very well. I also use foil muffins cups. I would highly recommend these if you haven't tried them before. The muffins never stick and they come out so much easier than the paper equivalents. Best of all the generic brand is only 59 cents at my local grocery store. I did find that I had to bake my muffins for slightly longer than the 35 minutes suggested by the recipe. This might have been due to the gluten free flour. I followed the remainder of the recipe as written. These muffins weren't sweet enough for me. It might be that I like my muffins almost as sweet as cupcakes, but even my husband who prefers things not sweet thought that these needed more sugar. I also thought that there were too many shredded carrots. I would reduce the total amount of shredded carrots, as written the muffins taste too much like carrots and not enough like raisins or coconut. Increasing the amount of raisins would also help the sweetness and flavor of the muffins overall. 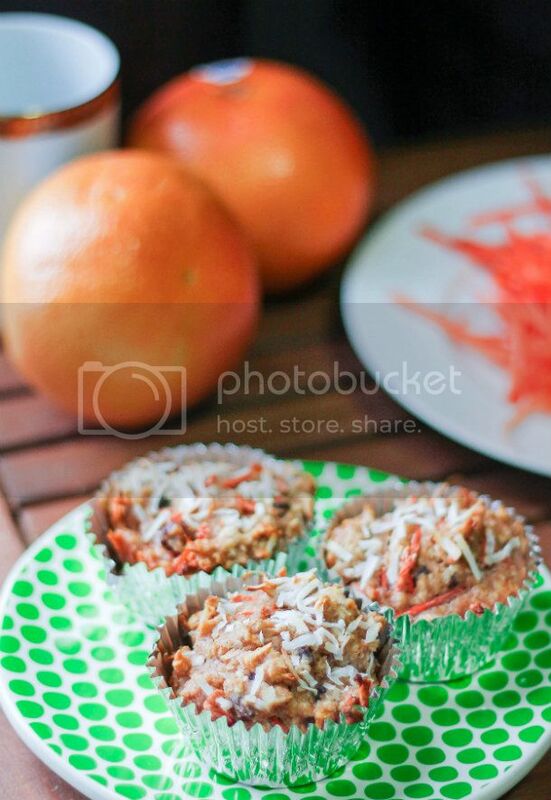 For the recipe go to Coconut-Carrot Morning Glory Muffins. I'm not normally a carrot fan, but I am thinking that the coconut may offset it enough for these to be really tasty! This sounds like a perfect combo for the morning! Carrots and ginger would make me feel a lot more awake! They do look good! I bet more raisins would help a lot with the sweetness factor. Sounds like you have been stuck in the kitchen lately feeding all your growing boys!